Play dead. Try practising the corpse pose in bed. Lying flat on the back with the palms turned upward is the most relaxing posture one can practise. This is because there is absolutely no need to contract or hold any tension in the muscles in this pose. You can just let all muscular contraction release. Deliberately relax the whole body systematically, starting at the feet and gradually moving up to the head. By the time you reach the shoulder area you should be feeling very relaxed and restful. So there you have it. There are many ways to tackle insomnia and get a good night’s sleep. And none of them involve counting furry, four-footed friends frolicking over fences, though I suppose it could come in handy as a last resort. Since breathing and exercise are good for insomnia, taking up yoga, which combines these elements, is an effective remedy. Our resident yoga expert Dominique says gentle, calming poses such as forward bends, twists, and simple inversions (such as lying with your feet up the wall) combined with gentle breathing are most effective. Lying on your back with your eyes closed, gently place your hands on your belly. Inhaling, feel your belly expand and rise up. As you exhale, feel it contract. Practise this for at least five to ten minutes at the end of your bedtime yoga routine. Here’s something you may not have considered: the colour of your bedroom may be keeping you awake. Studies have proven that the colour red stimulates the adrenal glands. This would definitely stop you from drifting off. Chromatherapists recommend switching to blues and whites as these have a calming effect on the body and mind. Perhaps meditating on calming colours before bedtime would help. In fact, meditating every day in general is a good idea for those suffering insomnia. Sit for ten to twenty minutes at whatever time is convenient for you, but try to make a daily commitment. Focus on the gap – the still point – between your inhalation and exhalation, which can take you to a place of deep peace. If the mind is very distracted then counting the breaths can be a useful tool. Just come back and start at one again if you lose count. Herbal teas such as chamomile and valerian root have been used as remedies for insomnia for centuries. 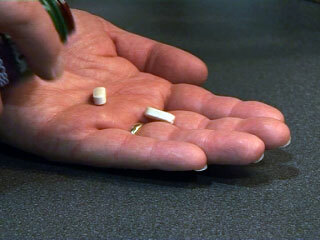 Valerian root has also been studied by western medicine and is often prescribed in pill form. This herb is effective in mild to moderate cases of insomnia and should be taken nightly over a period of one to two weeks. The good thing about this plant is that it doesn’t leave you feeling groggy in the morning and there are no negative side effects. As with any sleeping drug, however, valerian should not be relied upon long-term as it is not a cure for the condition. The reasons behind chronic insomnia should be sorted out and dealt with. A hot soak before bed is many people’s favourite way of guaranteeing some decent shut-eye. Aromatherapists recommend using a few drops of meadowsweet or orange-blossom to aid relaxation. Lavender, chamomile and marjoram are also sleep-inducing. If you have someone around who could give you a relaxation massage, all the better. Pay particular attention to your feet. Massage them for a few minutes with sesame or olive oil. This ancient eastern technique is thought to gently stimulate the acupressure points in the feet, and the nervous system as a whole. Exercise is also an amazing, natural remedy for insomnia. Aerobic exercise seems to work the best. Try going for a swim, a cycle or a run on the treadmill during the day to get that blood loaded up with oxygen and those lovely, relaxing endorphins flowing down from the brain. Dancing is a great way to get your aerobic fix without the boring factor. Don’t exercise in the evening before bedtime, however. It may keep you awake for a while. Perhaps developing a bedtime ritual will keep your brain trained to know when it’s time to switch off. Insomnia presents itself in many forms. Transient insomnia is the sleeplessness we all naturally experience before a stressful experience, like an upcoming exam or presentation. It can also crop up after a stressful experience, such as the loss of a loved one or retrenchment. This form of insomnia generally lasts for a couple of days and is a fairly natural response to stressful stimuli. But some forms of insomnia last for weeks, months and even years. And it doesn’t take very long for chronic insomnia to make you feel as if you are losing your mind. If your sleeping problem reaches this magnitude, you need to take immediate action. Look at your diet. Caffeine, tobacco, alcohol, excessive amounts of sugar. All of it has to go! Stimulants do just that. They stimulate. You want to be relaxed when you go to sleep. Counting sheep not quite leading you into a good night’s sleep? There is nothing more draining and frustrating than trying to lead a normal life whilst in the clutches of insomnia. Sleeplessness can strike at any time of life and the causes are infinite. But rest assured; there are a number of tickets to dreamland that don’t involve popping pills. Dominique Salerno is an inspired, passionate and enthusiastic yogi, teacher and healer. In 2000 she began teaching yoga full time and founded the Australian Yoga Academy. Since this time Dominique has dedicated her life to yoga and teaches yoga and universal laws relating to mind, body and spirit for in excess of 1000 hours per year. Dominique Santana Salerno is an inspired, passionate and enthusiastic yogi, teacher and healer. In 2000 she began teaching yoga full-time and founded the Australian Yoga Academy. Since this time Dominique has dedicated her life to yoga and teaches yoga and universal laws relating to mind, body and spirit for in excess of 1000 hours per year.